These 31 delicious vegan pasta recipes will impress vegans, vegetarians, and meat-eaters alike! All of these recipes are so delicious, comforting, and easy to make. Perfect for quick weeknight dinners! Pasta has always been the perfect comfort food for me. And the fact that I became vegan about 6 years ago didn’t change that! You don’t need meat, dairy, eggs, or fish to enjoy delicious pasta dishes. These 30 delicious vegan pasta recipes are the perfect proof! I’ve already got a lot of vegan pasta recipes on the blog. Some of them are even among the most popular recipes on my blog, like my vegan one pot pasta. But to provide you with even more delicious vegan pasta dishes, I teamed up with some fellow food bloggers. All of these recipes are 100 % vegan and many recipes are budget-friendly as well as kid-friendly. To make the recipes gluten-free, you can in many cases just use gluten-free pasta. … and sooo much more!! So let’s get started! As always, click on the heading above each photo to see the recipe. Pasta heaven, here we come!! These vegan meatballs are the perfect comfort food. They’re really easy to make, so delicious, and incredibly healthy! Serve them with spaghetti for a quick and easy dinner. I promise you that you will LOVE them. They’re one of my all-time favorite recipes! This 4-ingredient pumpkin sauce by Melissa from Cilantro and Citronella is tossed with sautéed mushrooms, garlic and herbs. All in all, it comes together in just 30 minutes! This vegan roasted red pepper pasta is super easy to make and it’s SO comforting! The sauce is packed with flavor and it’s incredibly creamy. I love serving it with fettuccine and sprinkle it with fresh parsley and red pepper flakes. BIG yum!! These penne with chickpeas in spicy smoked tomato sauce by Sophia by Veggies Don’t Bite is perfect for busy days! It’s easy, quick, and packed with protein! I absolutely LOVE pasta and I love quick and easy meals! So this Asian style vegan one pot pasta with coconut milk and red curry paste is absolutely perfect. It’s my new favorite meal for weeknight dinners. Easy, healthy, and so incredibly delicious and creamy. This rasta pasta by Melissa from Cilantro and Citronella is a total flavour bomb. 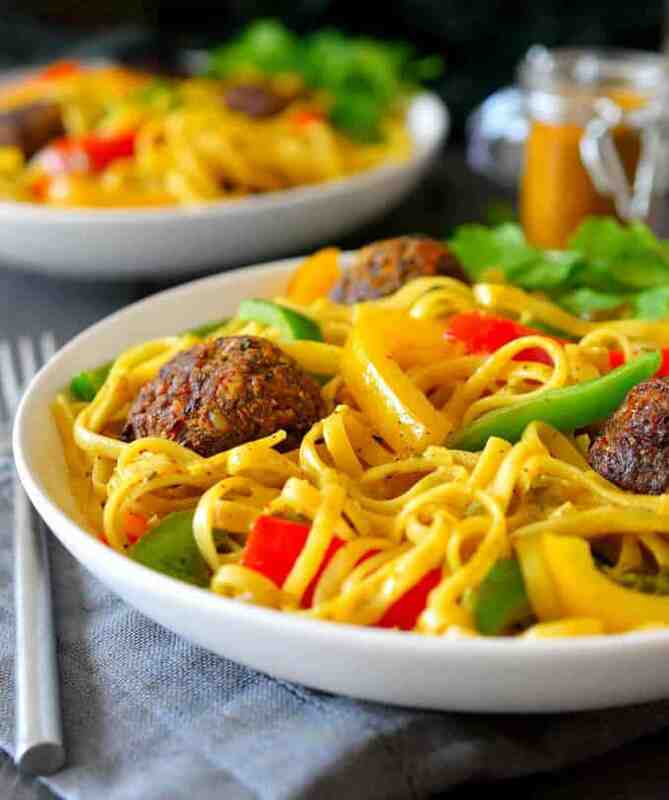 It consists of pasta with delicious vegetarian walnut balls and crisp bell peppers in a creamy curry coconut sauce. So delicious and super filling! 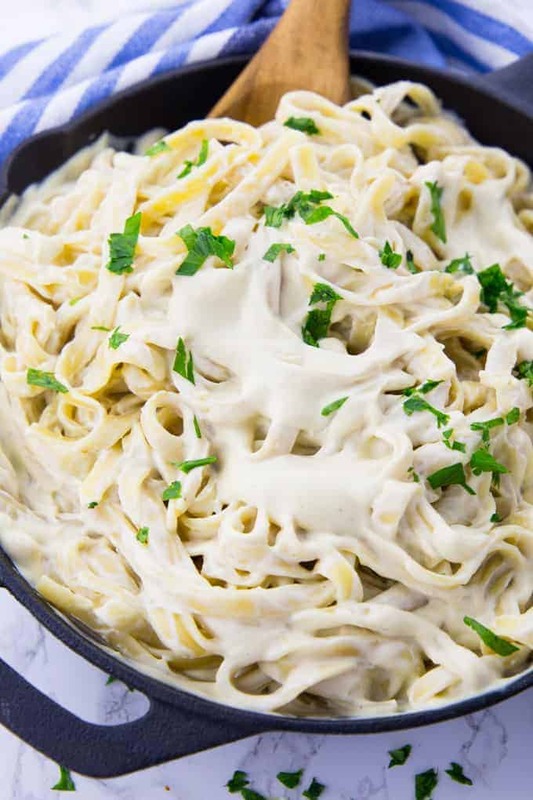 This vegan Alfredo sauce is the perfect comfort food! It’s so incredibly creamy and rich without being packed with butter and cream like traditional Alfredo sauce. And it’s super easy to make. 25 minutes is all you need! You need only five ingredients for this mediterranean pasta by Florian by Contentedness Cooking. Florian used hummus for the sauce and this pasta dish is vegan and gluten-free. And you need only 10 minutes to make it! Super easy, right? This broccoli pesto with pasta and cherry tomatoes is one of my favorite weeknight meals! It’s super easy to make, incredibly delicious, and packed with nutrients. Perfect for pasta lovers! Alissa from Connoisseurus Veg simmered tomatoes, red wine, and lots of spices with veggies and crumbled tofu for this vegan ragù. Enjoy it over pasta and top it with crunchy panko breadcrumbs! his Italian veggie pasta is my absolute favorite summer pasta recipe! It’s super easy to make and it’s full of color and flavor. I used cherry tomatoes, olives, zucchini, capers, and artichokes for this recipe. Oh, and don’t forget lots of fresh basil! If you love the aromatic flavors of traditional jambalaya then this cajun jambalaya pasta recipe is for you! It’s the perfect comfort food and it comes together super quickly. 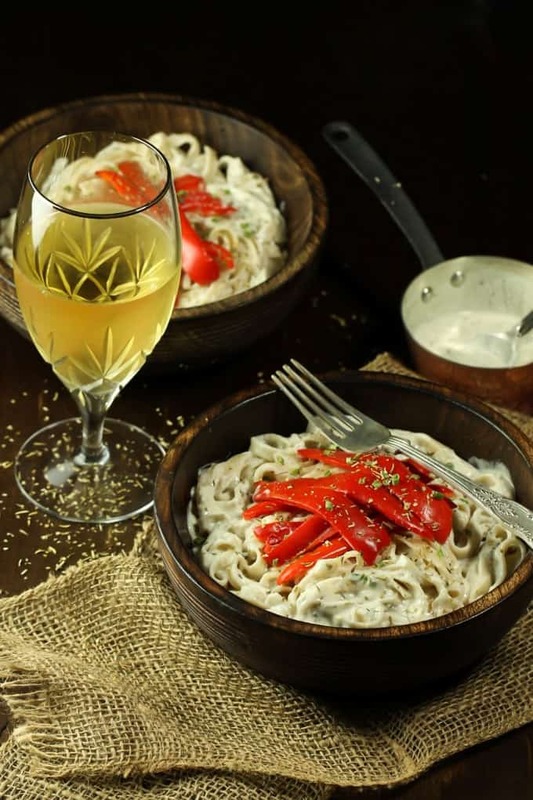 This vegan white whine sauce with roasted red peppers by Brandi from The Vegan 8 is perfect for cosy fall and winter nights! Brandi used fresh onions, garlic, plant-based milk, dried Italian herbs, and chardonnay for her white whine sauce. It’s oil-free but super creamy and rich! I definitely got a thing for vegan one pot pasta or one pot meals in general! This vegan one pot pasta with spinach and tomatoes is super easy to make, incredibly healthy, packed with flavor, and SO delicious!! It’s one of my favorite meals for busy weeknights. This fresh herb gemelli pasta by Linda from Veganosity is vegan simplicity at its finest. Linda used fresh herbs, garlic, and olive oil for this easy vegan pasta dish. Your kitchen will smell like you’ve been transported to Italy when you make this vegan pasta recipe! These lemon spaghetti with spinach are the perfect recipe for busy weeknights! It’s a one pot meal, super delicious, comforting, and 100 % vegan! Besides, it’s packed with flavor and a real crowd-pleaser! I’ve made this recipe so many times already! 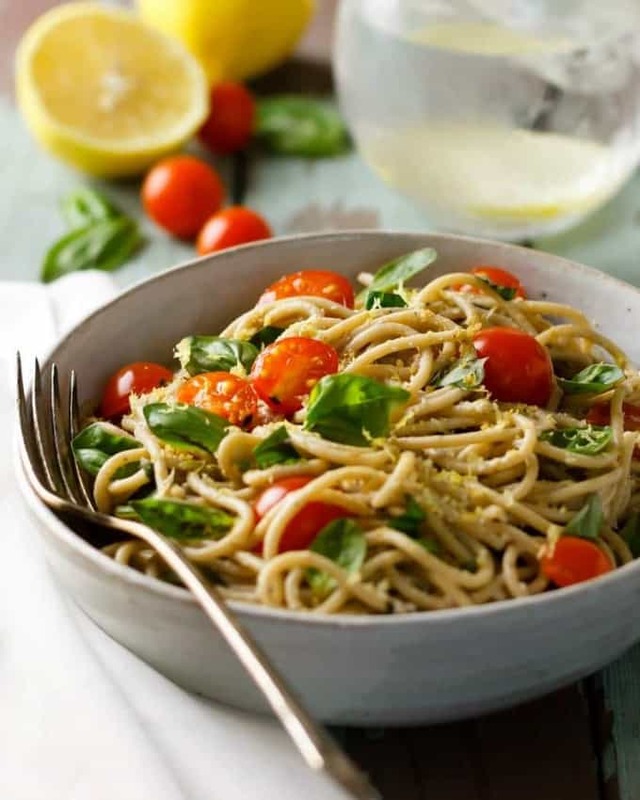 If you’re looking for a healthy vegan pasta dish, these Basil Alfredo zoodles by Anthea from Rainbow Nourishments are perfect for you! This dish is ready in just 10 minutes! 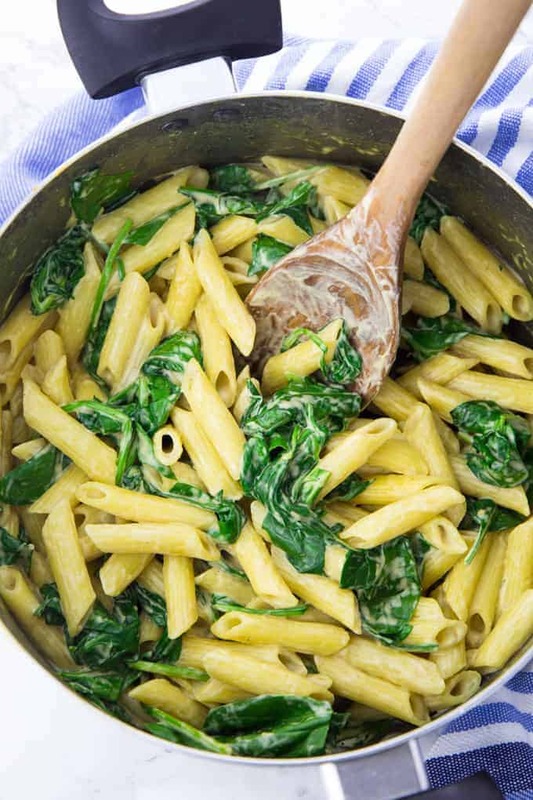 This spinach artichoke pasta is the ultimate comfort food! It’s super easy to make, incredibly creamy, and completely vegan! It makes such a delicious weeknight meal! This chilled peanut noodles with crispy tofu by Erica form Erica Julson are tossed with crispy tofu pieces, refreshing cucumber and bell pepper. And don’t forget to add some cilantro and sesame seeds on top. This smoky Cajun black eyed peas pasta by Jenn from Veggie Inspired is an easy and budget-friendly dish. Besides, it’s perfect for kids and makes a great family dinner! Have you ever tried vegan one pot spaghetti with vegetables? It’s so delicious and easy to make! Just perfect for lazy days! This habanero sweet potato pasta by Julia from Savory Tooth is SPICY. However, the spiciness is nicely balanced by soft sweet potato cubes and a basil garilcky tomato sauce. So delicious! This Mexican pasta bake by Florian by Contentedness Cooking will be a a real crowd-pleaser! It makes the perfect party food, lunch, or regular dinner! This vegan chicken Alfredo with textured vegetable protein is so delicious, creamy, rich, and decadent. No dairy or meat needed! This vegan carbonara by Melanie from A Virtual Vegan is so simple and yet so decadent! Melanie topped it off with a scattering of smoky carrot rashers! Cadry from Cadry’s Kitchen topped her vegan buttered noodles with oyster mushrooms that have been sautéed with garlic and then deglazed with a couple tablespoons of Malbec. Simple and delicious! These vegan stuffed shells by Jenn from Veggie Inspired are filled with kale and savory pumpkin. While being easy enough for a weeknight, they’re also impressive enough for guests. This spinach and caramelized onion pasta by Evi from Green Evi is vegan, oil-free, and super easy to make. Evi paired fresh spinach with sweet onions, fragrant sage, and a creamy miso walnut sauce. So many delicious flavors! This 20 minute lemon basil pasta by Gin from Eat Healthy Eat Happy is quick, healthy, and packed with fresh flavor! Finish with easy walnut parmesan for a vegan protein boost. Dosen’t this vegan meat sauce by Sophia from Veggies Don’t Bite look super delicious? It’s oil-free, fat-free, and super hearty. And packed with sneaky veggies! I hope you enjoy these vegan paste recipes as much as I do! Don’t forget to pin or share this post so you have these recipes ready when you need them! If you give any of these vegan pasta dishes a try, I’d love to know what you think about it. Just leave me a comment below. Your comments really make my day! Thanks so much for including my pasta recipes! I’ll share on my end as well! 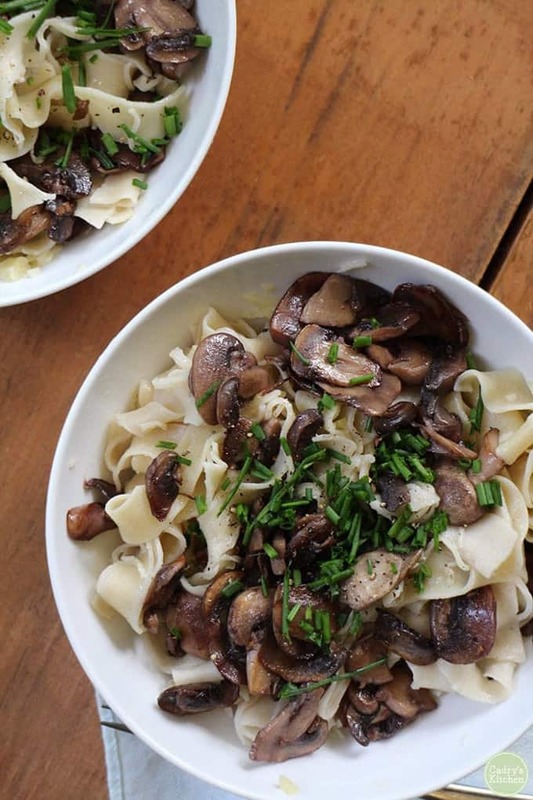 Thanks so much for including my pumpkin mushroom pasta! There are so many great recipes here, I can´t wait to try some! Pasta! This collection of noodles makes me want to get cooking at 7:00 am. :) Thank you for including my recipe. Sharing everywhere. LOVE my pasta!!! We eat pasta at least once a week, sometimes more. It’s always a family favorite no matter what I pair it with. Thanks for including a couple of mine! Will share! I love pasta! I could happily dig into any of these. Thank you for including my pasta with red wine infused mushrooms. The recipe for the stuffed shells isn’t there. The title for it is One Pot Spaghetti and it takes you to the same recipe. Can you please tell me how to find the shell recipe. Thanks. “Bean” balls or “meat” balls?… is this “vegan” or not?